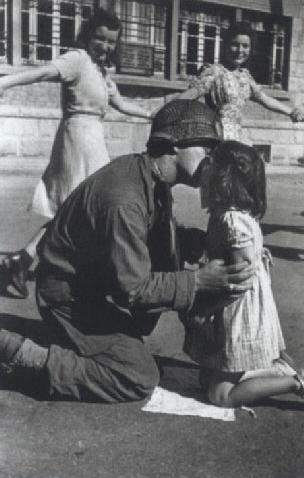 Tony Vaccaro is one of the most respected photo-chroniclers of WWII. We look at the story behind his iconic photography. This advice led Tony Vaccaro to take over 10,000 photographs, both as a soldier and a civilian, recording the brutal realities of WWII and its aftermath. As a young GI in the 83rd Infantry Division, he took part in the Normandy Landings armed with an M-1 rifle and an Argus C-3 camera – a rather amateur model that had one invaluable quality: it was almost indestructible. After one particularly rough dive for cover, a large chunk was chipped off the tip of the camera, and Vaccaro was convinced that, had it been any other camera, his vast portfolio would not exist today. But a chipped camera was the least of Vaccaro’s worries. Taking photographs while entering potentially deadly combat situations would require a dexterous balancing act: with his rifle crooked prone on his arm, he would snap a frame, let the camera drop to the strap round his neck, and quickly move on. Some negatives were damaged as a result of the harsh conditions he found himself in, and many show water marks and stains suffered in the field. Yet, these imperfections only make the resulting photographs more intense and immediate – the flaws in the image help to capture the reality of a chaotic battlefield. The challenges he faced included a shortage of 35mm film and the distinct lack of battlefield darkrooms. So Vaccaro had to improvise. In Germany, whenever his regiment entered a town, he headed for the nearest camera shop or pharmacy and took whatever photography equipment he required. The development process, too, was an improvised, haphazard, night-time operation. The developer was poured into a borrowed helmet while his own was used for the fixing chemical that preserves the negatives – a fiddly, frustrating procedure, often resulting in spilled chemicals and compromised photos. But it paid off . Vaccaro’s shots were developed, and he arranged to have them mailed back to his sister in America. Disaster struck, however, when the first batch, which included all his work from Normandy, was confiscated by a military censor and never returned. From then on, Vaccaro never let his work out of his sight, keeping his developed film rolled on a movie film reel and stored in his backpack. At one stage, he even risked going AWOL to retrieve some negatives that had been taken from him, so eager was he not to lose his work. 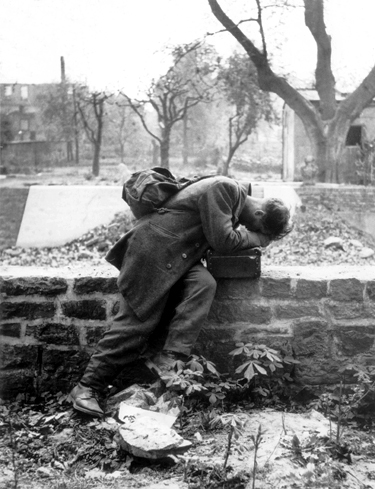 In comparison, the photo of a German prisoner of war returning to his home town of Frankfurt to discover his house bombed and his family no longer there, shows the kind the depressing moments of dejected subjects we associate with images of war. No stranger to scenes of despair, Vaccaro caught the defeated man in the throws of grief, as the bombed shells of former houses loom eerily behind him. Evoked here is a quiet grief, a silent inner turmoil raging within the man shattered by the overwhelming news of his loved ones. Together, these two images showcase Vaccaro’s talent for capturing a moment, joyous or devastating. His enormous collection of war-time images, however, was just the beginning of his career. After witnessing the end of the war in Berlin, he stayed on as photographer for the US Army newspaper until 1949. A year later, he returned to the States, where he worked for Flair, Look, Life, and Venture magazines. best fashion photo from the esteemed Art Director’s Club in New York. Tony Vaccaro lives and continues to work in Long Island City, New York. Is it possible to write to Tony? My name is Vaccaro. My father was the 13th baby of parents from Cicily, 12 of the children were born in Cicily and only my father was born in the U.S. Michael James Vaccaro and his father was Frederick Vaccaro and mother’s maiden name Trombolo but I don’t know the spelling. His oldest sister was Grace. But I don’t remember the others. I was just wondering if Tony might be related to my family or know someone who is related to my family. My father was Dr. Michael James Vaccaro who built the Goddard Space Flight Center in Greenbelt Maryland. He was one of the scientists who began NASA. I’m just wondering about relatives. Best of luck and regards from Cologne.